The Enterprise visits Ligon II, a planet with a tribal culture of beings who have manufactured a much-needed vaccine. A Ligonian leader, Lutan, kidnaps Lieutenant Yar and threatens to withhold the vaccine unless she fights to the death for his honor. There is something deeply racist about the Ligonians. I really wish they had cast some white people to avoid that. Even the cast has admitted that this episode is an embarrassment, with the director being fired halfway through production and Jonathan Frakes later citing "Code of Honor" as his least favorite episode of them all. This is the first time we get to see Picard as a diplomat. It is one of his strong suits to be sure. Yar's stunt double looks nothing like Yar. We get to see Geordi and Data bonding. Data calls him "my friend" twice. 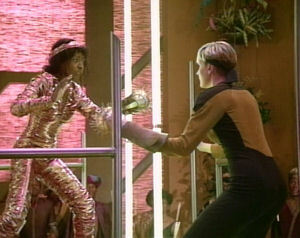 But apparently, Data has told Geordi 662 jokes and yet they are still friends. Remarkable. I understand Data's confusion when he almost insults the French in front of Picard. Despite his name, Jean-Luc sure seems decidedly not French. Do all Ligonian males have a scar on the side of the face? Must be some tribal right of manhood or some such nonsense. That's twice in three episodes that they've shown concern for the Prime Directive. Way to show up Captain Kirk. I can't wait for Troi's accent to go away. This isn't the last time we see Troi and Data learning all they can learn about an alien culture. They do the same thing in "Darmok," for example. Perhaps that's one of their explicit duties.